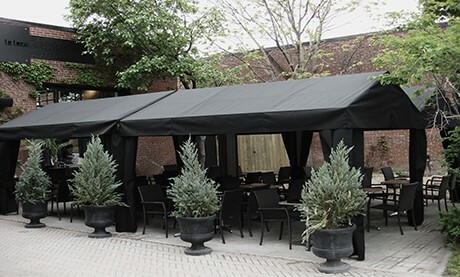 Le Local is an urban restaurant located in a centenarian building in Old Montreal, where enjoyment extends outdoors thanks to Cuscini Design’s garden pavilions. The latter creates an atmosphere that is both industrial and modern, where up to 160 covers can be served, terrace included. The Concept Terrasse by Cuscini-Design is situated at the entrance of the restaurant, annexed to the former architecture studio. Stay up-to-date with the latest news! Sign up today!